It’s that time of year…Graduation! Whether it’s kindergarten, high school, or college, this is definitely a big part of the year. Everyone’s babies are growing up. With this particular cake, I really like the theme behind it. Mom and daughter were announcing what college she’s decided to go to through this cake at her high school graduation party. Ohh, the suspense. It was a very cute idea, and this definitely lit a fire under my bottom to try two new things that I hadn’t done before…a frozen buttercream transfer and petit fours. The first experiment was the petit fours. Over the years, I’ve been asked quite a few times if I could make those, but the answer was always, “No, I have never made those.” Well, after this last time of being asked, it was finally time to buckle down and give it a shot…and I’m really glad. The graduate absolutely loves petit fours, and the two local bakeries that the mom usually went to was booked solid with other graduation cakes and goodies. So, we started talking about the design of the cake. 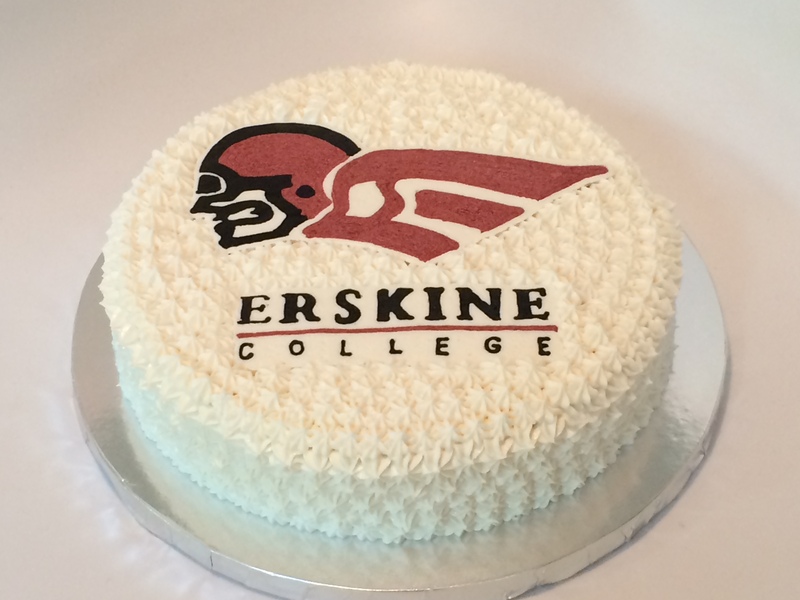 First, I did a search for Erskine College cakes…but didn’t have any luck there. Okay then, starting from scratch. As we looked over the website and I was getting ideas for colors and how to decorate the cake, she asked me if I could put the emblem on the cake. Since I had never done a real transfer on a cake, this made me nervous, but had seen it done before on several YouTube videos, and knew it was time to give it a shot. The most helpful video was the one made by Wilton, so I followed her lead. Overall, I was very happy with how all of this turned out, and am excited about doing this more in the future with different designs. The flood gates have been opened. Click HERE to watch the Wilton video. For the petit fours, I stuck with the school colors and made them simple. It was a good thing and bad thing when I was making these though, because after I trimmed the cake down for the petit fours, I couldn’t stop eating the leftover cake scraps. Click HERE to watch the video that helped me most with petit fours. 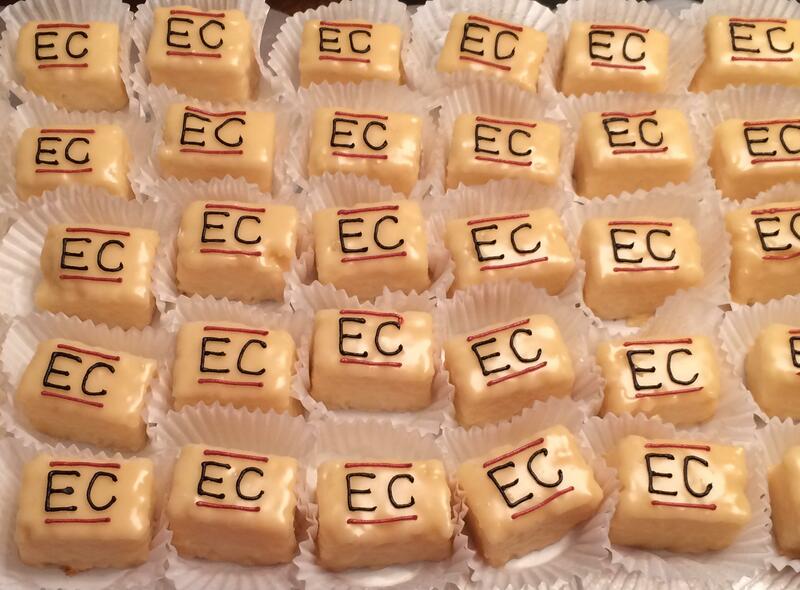 The base poured fondant over the petit fours is a light yellow/gold color, along with the deep red and black for the school colors.